Получена e-QSL с новым оформлением от IBC Italian Broadcasting Corporation из Италии (трансляция через Армению) за рапорт от 22 ноября 2017 года. Станция теперь ведет регулярные трансляции, каждую среду из Gavar, Armenia на 5845 Кгц 19.00 - 21.00 UTC. 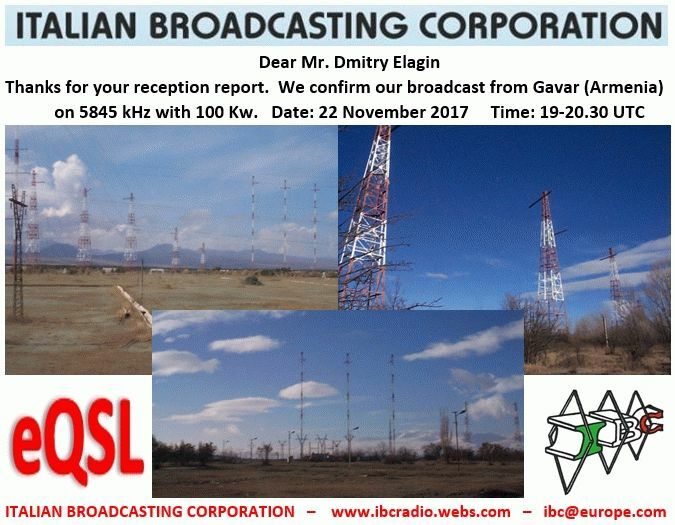 We send our special eQSL to confirm your report for the broadcast from Gavar, Armenia. If you need our paper QSL and sticker we ask for a donation, sorry. We will read your report during the "Listeners' Mailbox" on air from next Tuesday 5 December on all our English transmissions. We broadcast now regularly on 5845 kHz, every Wednesday, from 19 UTC in Italian, AND FROM 20 UTC ALSO IN ENGLISH (AT 20.25 "IBC DIGITAL" IN MFSK32 1500 HZ).